Throughout my life, I have owned guitars from almost every manufacturer; including several custom-builds. From years of playing, I discovered things that I liked and disliked about each instrument. The different shapes and materials create variable sounds with a tone that is unique to every player. Working with wood on a daily basis, it only seemed natural that I solve this issue for myself and begin my quest for "the tone." Burchette Guitars are handcrafted and built with a sequence of ideals from several different guitars I have owned and/or played. I only use all solid wood on my guitars. I want to create beautiful instruments that appeal to the eye and the ear. Different combinations of exotic and figured woods will ensure a great sounding instrument and a unique expression. All solid woods are more difficult to shape and build, but absolutely worth it. I use a modified X-brace system, a simple bracing that is time-tested. Using two or three fewer braces than tradition, I load the guitar top so it will respond like the head of a drum. With an impedance-matching bridge, it closely follows the shape of the guitar body and string mass. Furthermore, I place the bridge in the center of the lower bout by using a 13-fret neck-body joint. The guitars are finished with nitro lacquer - thin, strong and durable to ensure that its allure will last a lifetime. Why do I build? My primary goal is for the guitar to catch your soul and inspire creativity. That little extra sustain, that growl, those sweet overtones get people to listen deeper and try new things. The tone is what it's all about, anyway. If I can help you find yours, then my job is done. I use the best materials available in the construction of Burchette Guitars. With that being said, they are warranted against defects in materials and workmanship for the life of the original owner. However, Burchette Guitars ARE NOT warranted against damage resulting from normal wear and tear, abuse, neglect, extreme temperatures, humidity or "acts of God. Guitars require periodic maintenance which is the owners responsibility and a condition of warranty. Other ways to VOID your warranty include: storing your guitar without proper humidification, in direct sunlight, in extreme hot or cold conditions (in your car!). A guitar care instruction sheet is included with the purchase of every instrument - please read it and use the tips provided! 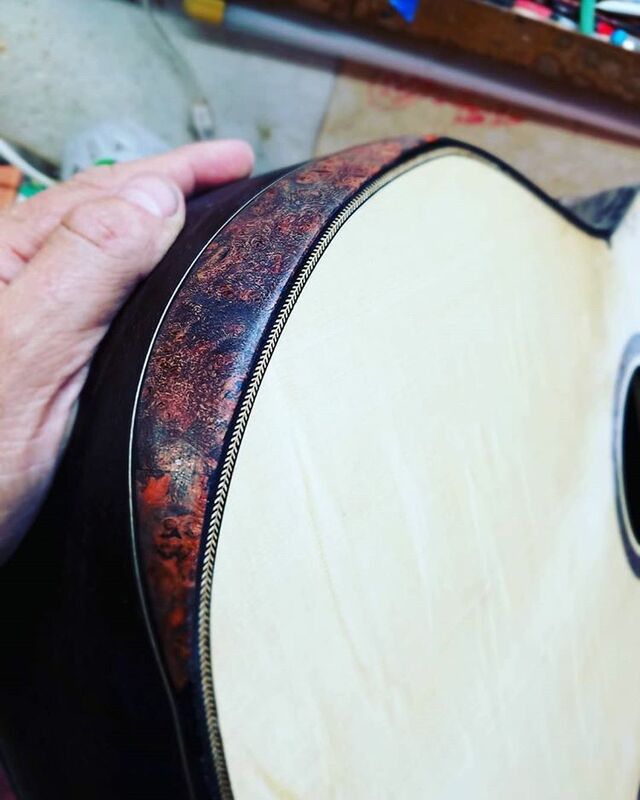 Repairs or alterations not performed by Burchette Guitars will result in the warranty being voided. If your guitar is in need of repair, adjustment, or a little TLC not covered by the warranty, I will be happy to price repairs. Burchette Handcrafted Guitars is not responsible for damage associated with third party shipping companies. I recommend purchasing insurance for the amount it would cost to replace your instrument. Temperature and Relative Humidity (RH) are the most important factors Burchette Guitar owners can be aware of. A guitar case is the best storage method for a solid wood guitar, as it protects the instrument from extreme temperature changes and assists in maintaining a consistent RH level. Extreme Temperatures can quickly cause cracks to the lacquered finish of your guitar. Hot and cold temperatures also draw moisture out of the wood, leading to actual cracks in the guitar body! Extreme temperatures can ruin your guitar and it is best to maintain a consistency when transporting. Relative Humidity (RH) is measured with a hygrometer that can be purchased at most guitar shops. Your Burchette Guitar should be stored in an area with a RH of 45%. If you must keep your guitar out of its case, store it in a climate controlled room with a RH of 45%. This can easily be achieved by running a room humidifier. I have a few instruments out of their cases during the winter, requiring me to add up to a couple gallons of water EACH DAY to my room humidifier! The BEST Advice I can give a guitarist is to store your instrument in a humidified case during the winter or anytime your heat is on.